An Australian newspaper is defending its cartoonist Mark Knight's depiction of Serena Williams at the U.S. Open. The cartoon drew widespread criticism for reducing the tennis star to "racist" and "sexist" tropes. Knight has since deleted his social media accounts. An Australian newspaper is defending a cartoon depiction of Serena Williams' U.S. Open outburst after widespread online criticism called the caricature "racist" and "sexist." "The cartoon about Serena is about her poor behaviour on the day, not about race. The world has just gone crazy," said cartoonist Mark Knight. Damon Johnston, editor of the Herald Sun, backed the Knight drawing in a tweet saying the "cartoon is not racist or sexist" and that "it rightly mocks poor behaviour by a tennis legend." 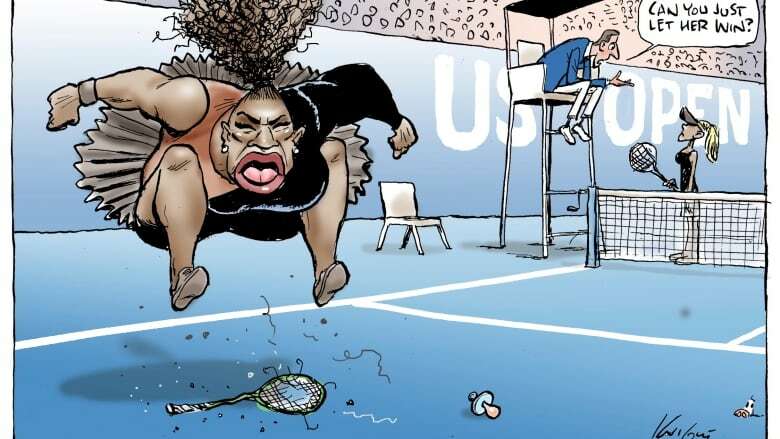 The defence comes after many online denounced the cartoon for its exaggerated features of Williams where she is seen stomping on her racket while the chair ump asks her opponent: "Can you just let her win?" Some also believed the cartoon "whitewashed" U.S. Open winner Naomi Osaka, who is mixed race, by depicting her as a blond, white woman. In response to the controversy, the Herald Sun went a step further and shared an early copy of Wednesday's front page. The headline reads: "Welcome to PC world" and includes the Williams cartoon and a collage of several other Knight caricatures. In a social media post, Peter Blunden, managing director of News Corp.'s operations in the state of Victoria, said: "Australia's finest cartoonist Mark Knight has the strongest support of his colleagues for his depiction of Serena Williams' petulance. It's about bad behaviour, certainly not race. The PC brigade are way off the mark ... again." According to the Times, umpires may boycott Williams matches after her behaviour at the U.S. Open toward chair umpire Carlos Ramos. Williams was fined a total of $17,000 US for three code violations during that match for "verbal abuse," being warned for coaching and for breaking her racket. Knight has since deleted his social media accounts.